Born April 15, 1930, in Mt. Vernon, Washington, Wick Peth discovered as a teenager that he had a talent for protecting riders from bulls. Though he began his professional rodeo career in 1950 as a bull rider and steer wrestler, Peth soon embarked on a 35-year career as a professional bullfighter. A pioneer in modern rodeo bullfighting methods, Peth donned gear that allowed for faster movement. He focused on studying both the bull and rider, foregoing props and clown makeup in favor of mental and physical fitness. 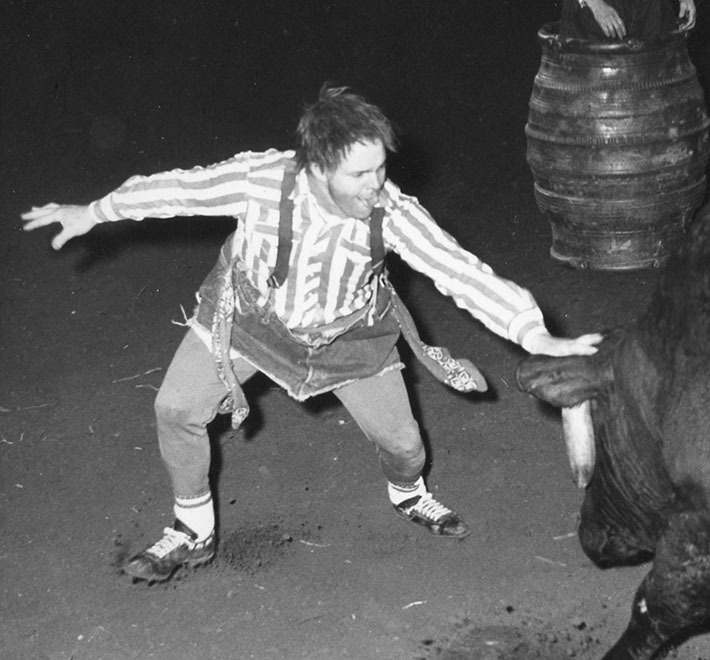 His performances were aimed at not only entertaining the crowd, but also at “turning the bull back” to ensure higher scores for the bull riders, and distracting the bulls once the riders were off. Peth appeared at the National Finals Rodeo as a bullfighter eight times (1961, 1962, 1963, 1964, 1966, 1969, 1975, 1979) and was selected as an alternate several times more. He was a member of the inaugural class of inductees to the ProRodeo Hall of Fame in 1979 and the Bull Riding Hall of Fame in 2015. Along with the Montana Rodeo Hall of Fame, Peth is a member of halls of fame at Cheyenne Frontier Days, the St. Paul, Oregon, Rodeo, and the Ellensburg, Washington, Roundup.